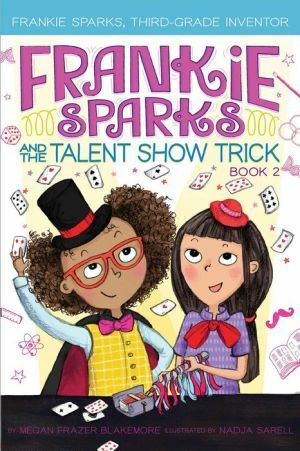 Frankie Sparks uses her inventing skills to help her friend overcome stage fright in this second chapter book in the STEM inspired Frankie Sparks, Third-Grade Inventor series. It’s time for the annual school talent show, and Frankie is excited to audition with her magic act! She wants to be just like her idol, Adelaide Herrmann, Queen of Magic. But on the day of the audition, Frankie’s best friend and Magician’s Assistant, Maya, gets a big, scary case of stage fright! How can Maya be Frankie’s helper on stage if she can’t bring herself to speak in front of their audience? It’s up to Frankie Sparks to invent just the perfect thing to help her best friend cope with the spotlight!